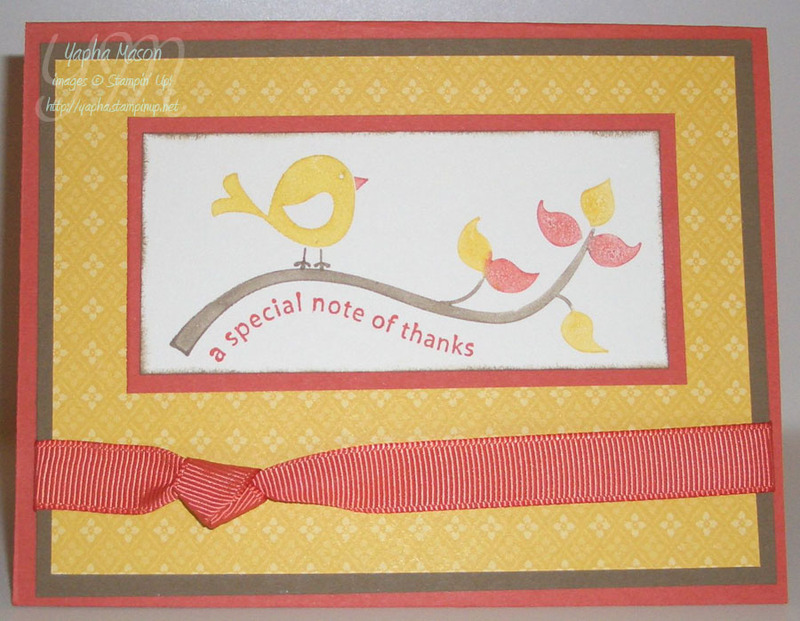 « Stampin’ Addicts My Digital Studio Blog Party! This week’s challenge over at Pals Paper Arts is a theme challenge, with the theme being Gratitude and Thanks. As I was looking through my stamp sets trying to decide what to do with this theme, I realized that I hadn’t used Cheep Talk in quite a while. And since the weather has finally turned fall-like (here in Los Angeles that mean the low 70s…), I decided to use Cheep Talk with a fall color combo. I’m very happy with the way it came out! I just have to say again how happy I am that the Stampin’ Write Markers are available in the In Colors this year! sweet – love the in color combo……….. I love your wonderful card, Yapha! I love this stamp set and love how you paired it with these great colors! Very nice! Great job! Such a cheery card! I love the colors that you selected! Thanks for playing @ PPA!